To their owners, automobiles have increasingly become a valuable item that needs to be protected and cared for with the utmost attention. In addition to depending on its professionalism, the choice of which repair shop to entrust one’s car to also depends on the image of order, cleanliness and expertise offered by the workshop. So, attracting the attention of motorists is important if you want your business to expand. The way you present yourself to the world is a factor that conveys professionalism. 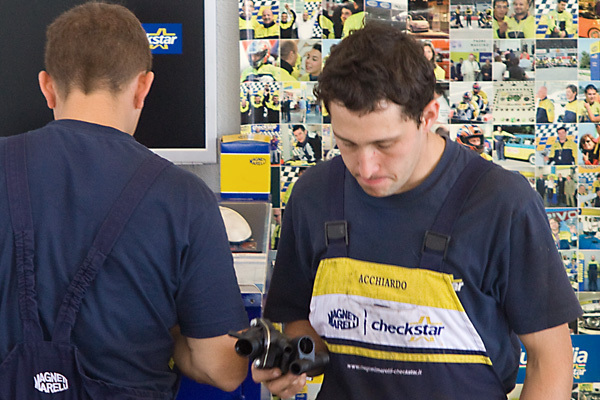 Magneti Marelli certifies the professionalism of its Workshops through a series of identifying elements, such as plates, distinctive interior and exterior elements, crucial for conveying an image of order, cleanliness and efficiency that will, without a doubt, set the Magneti Marelli Checkstar Authorized Workshop one level above any other independent repairer. To this end, identifying elements are provided for the workplace, along with advertising material and professional clothing. Co-Marketing activities with important partners in the automotive world or consumer goods are essential to acquire new customers. Magneti Marelli answers this need both at national and international level with fidelity programs, direct marketing and incentive campaigns.